I always loved math and art, but could never draw very well. At age 13, I took a weaving class at summer camp. It was like a miracle! 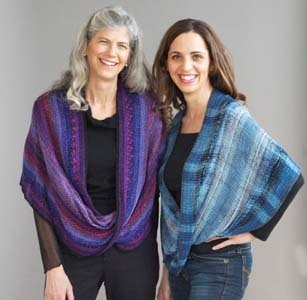 You put gorgeous colored yarns on the loom and pull off a piece of fabric. I am continuously in awe of the process. I weave on a 4 harness LeClerc jack type loom and an 8 harness Baby Wolf Schacht loom. The surprises that emerge from combining different types of yarn, colors and textures into one warp always amaze me. The simplicity of the grid combined with the limitlessness of the textures and hues keep seducing me to design my pieces. I weave mainly with bamboo, rayon and Tencel. 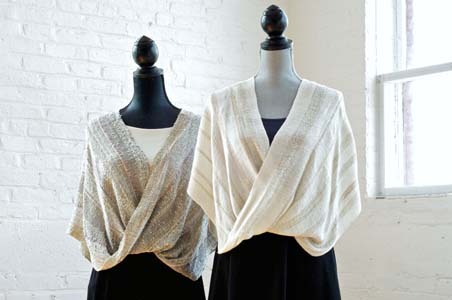 They weave up into fabric that has a wonderful “hand”, great drape, and resiliency. 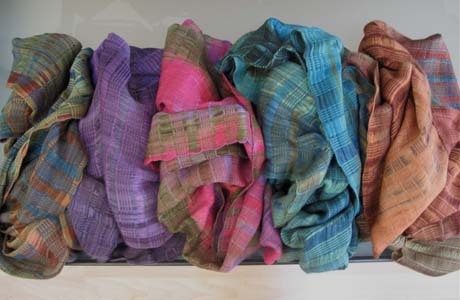 You can roll up a scarf or shawl into a suitcase, open it up and it will be perfect. My painted warps allow me to create one-of-a-kind pieces with a limitless number of colors. The warp threads are my canvas.